Hervieu, who was born in Alençon, was well known as both an artist and a writer. She exhibited only once in her lifetime, in 1910. Thereafter, crippled by a hereditary disease, she abandoned painting in oils and began to work almost exclusively in charcoal or chalk on paper. Her novel Sangs (Bloods), drawn from her poignant experiences as a victim of her disease, reached a wide audience and won the Prix Femina, an important literary prize, in 1936. 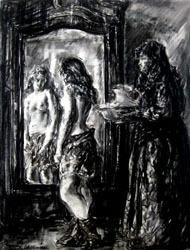 According to Bénézit, “Her sufferings nourished her talent and were the beginning of her fame.” As her illness became more severe, she had great difficulty working even with chalk and charcoal, and she perfected a laborious technique using a razor blade to scratch away portions of the chalk or charcoal she had applied to the paper. She was masterful in her handling of light and shadow, and became especially known for depicting figures, often nudes, in richly detailed interiors. She also did superb still lifes. In spite of her handicap, she produced a considerable body of work and illustrated numerous books, including the poems of Charles Baudelaire and Paul Verlaine. She also illustrated her own works and produced several albums of drawings. The Musée National d’Art Moderne in Paris has an important series of her drawings done between 1929 and 1941. A biography of Hervieu by the American scholar Joan Halperin is currently in preparation. Listed : E. Bénézit, Dictionnaire Critique et Documentaire des Peintres, Sculpteurs, Dessinateurs et Graveurs, Gründ, Paris, 1999 and Gérald Schurr and Pierre Cabanne, Dictionnaire des Petits Maîtres de la peinture, 1820-1920, Les Éditions de l’Amateur, Paris, 1996. The drawings in this collection are framed to museum standards using all acid-free materials and Museum Glass to protect the works from the harmful effects of light. The hand-crafted frames were made by the distinguished and venerable French framemaker Les Cadres Gault.